The M60A2 "Starship" is a rare version (less then 600 build) of the M60 Patton tank. It was able to fire both conventional ammunition and missiles. It wasn't a military success, to much new technology in one vehicle but the lessons learned where valuable for tank development. It was the first tank to use a laser range and targeting system and a lot of this technology was later used on the M1 Abrams for example. The turret is the only difference with a M60A1 or A3 version on the outside. The A2 turret ha a very small profile, a desirable trait to have for a tank. Esci had a plastic model of this tank, Italeri has the molds but has not released the kit. 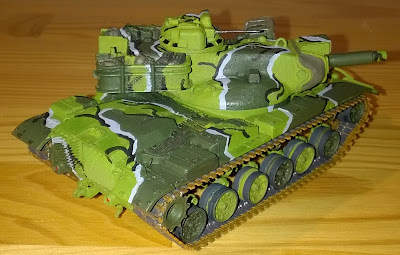 Modelltrans produces a resin conversion set for the very good Revell model. The turret features a nice cast texture. Maybe a little bit over scale but it doesn't look bad. 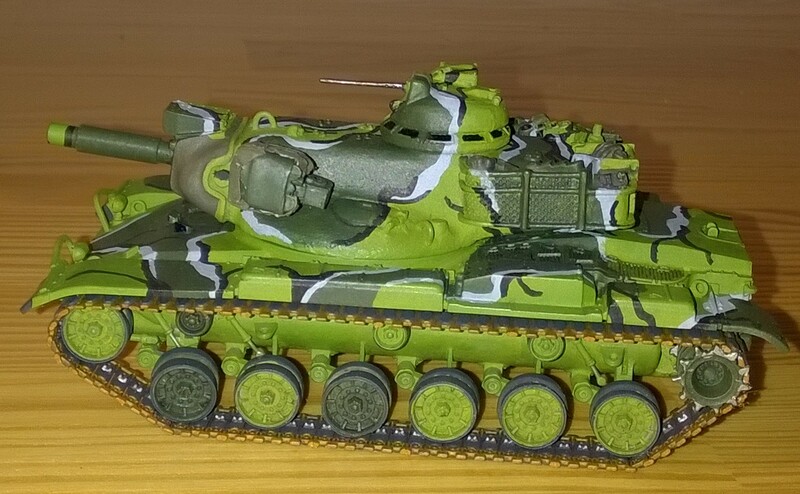 The parts also include M48 outer roadwheels for the early version of the M60A2 but the wheels from Revell can also be used. There is also a choice between two gun barrels. The only part with a slight flaw is the searchlight which has a mold line running through it. I made a cover for the light from paper. This cover is seen on almost every photo of the actual tank. The stowage racks are molded with stuff in them but the smoke granate launches are still visible, some careful painting is needed to bring out all elements here. 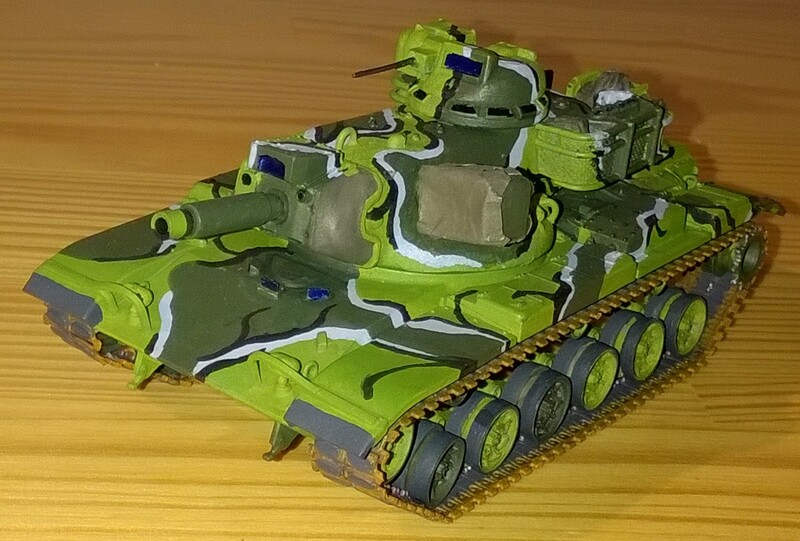 I painted my tank in the 'tropical MERDC scheme'. There have been M60A2's painted in MERDC scheme's but I'm not sure if the tropical scheme has been featured on this particular version of the M60. 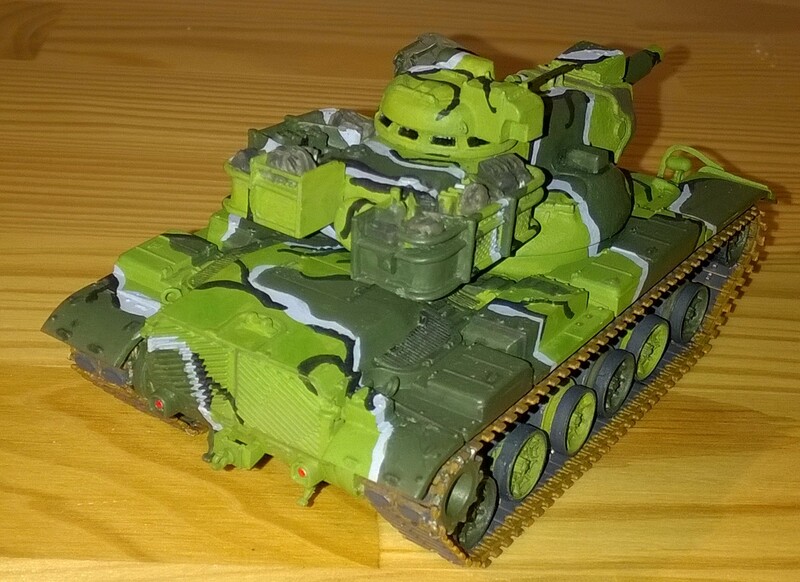 I found the colors fresh however and fitting with a tank that is mainly famous for being a testbed for all sort of new technologies. The model is not weathered to emphasize it's modernity. Not that there is no mud or sand in the future but it just looks more futuristic this way.